Naomi Rose: It’s Easy Being Green! Spring weather is FINALLY starting to hit upstate New York, so I had to celebrate with some spring colors and an outfit post! This is the famed Liezl Wrap, with a 2-in-1, sari sash, and a lace sash added in at the front just for detail. That blue floral silk is just one wide panel of the sari sash – I love experimenting with them so that some colors show quite a bit and others are much more subtle! In this case I liked featuring the blue and green strips, since they were reflected in my shirt. One challenge with pastels and other spring colors for fair-skinned ladies like me is to not look washed out. Light pink, for example, just won’t work next to my face. But the slightly richer, cooler range of pastels (greens and turquoises) is just perfect! How do you like to wear spring colors? 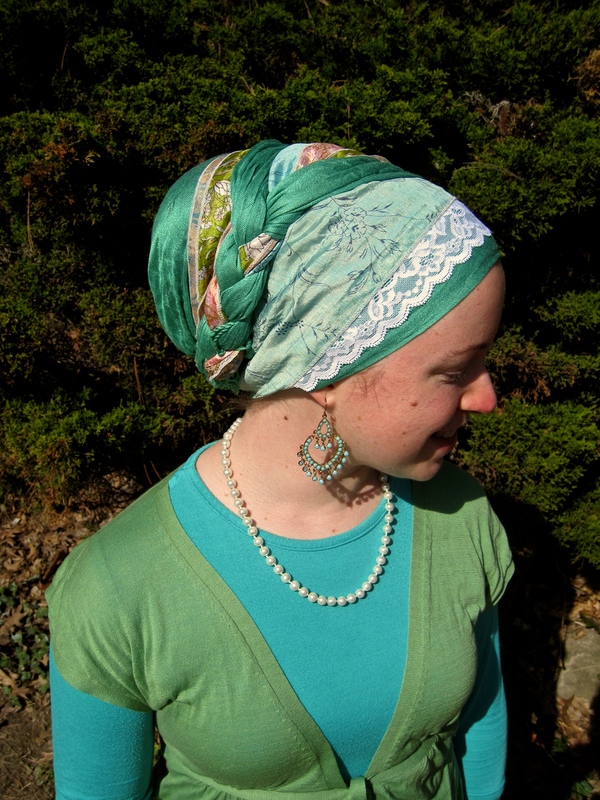 I hadn’t thought of braiding the sari scarf – it looks gorgeous! Pink does not work for me, either. But most shades of light green and some shades of light blue are o.k. for my pale skin. All the way from South Africa. It is beautiful and inspiring .